Most of the web pages and blogs claim that there are no preparation guide or materials for CEED Exam. It's true that CEED Exam depends mainly on your design-ability skills. You need to do in-person a lot of practice and sketching work - as CEED Exam is time bound. However, there are some exams and preparation tips that will guide you and probably help you improve your creative thinking abilities. Let's go through some of the resources under separate headings. Most of these resources and materials are prepared by me for your smooth preparation. I tried in every respect to deliver almost all the requirements (resources and guides) for your CEED preparation. Some other external links and books can be found on internet, but it might be difficult for you to find them and gather together. I, therefore, grouped them in this page under different sub-headings for your convenience and better understanding. You may also get CEED previous years question papers at the end of this page. Sketching is the most important part of your CEED exam. Usually drawing is a mode of communicating your ideas in paper (visually). This type of visualization is an important tool for those aspiring to do Animation Design as career. Even this type of questions usually appears in CEED exam. Basically it deals with step-by-step image movements; which when put whole-together helps to create videos or animations. Solving Geometric object type of questions improves your imagination as well as visualization skills; thus CEED examiners usually include object type of questions regularly. I therefore worked with some examples and included step-by-step process for solving such type of questions. Evolution generally mean product cycle from past to present. So, you are generally required to observe and identify the everyday use items (say TV) from old to new generation. Like I said in my other blog pages; sketching is just a tool to represent your ideas, in other words its a mode of communicating your ideas. Now, when you don't get creative ideas then there is no meaning of learning about drawing or sketching. You must first focus on ways of developing your creativity and design thinking skills. of course the above section on illusions and hidden words will also help you develop your thinking skills. 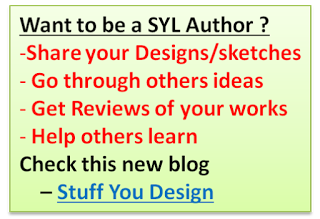 Here is my posts giving in-depth ideas on "how to improve your creativity and lateral thinking"
I had detailed and categorized materials as well as manufacturing process with examples of day-to-day products. UI Designs are a form of Visual communication or I can say it's more or less related to Interaction Design (IXD) and CEED started asking similar questions recently. The fact is UID questions are easy to attempt and even they consume lesser time compared to other design questions like Product design, story board framing or even comic strips. The only thing you must consider is to know about how it can be designed and what are the basic principles involved in UID. Discussion on Storyboard and Poster making is a lengthy process and so I grouped that in separate page. Please go through that and check the links provided for tips and guide. Finally, Let us see the links for getting downloadable format of previous question papers for practice. There are no secret to success. Success is directly proportional to your preparation, hard work and learning from your failures. Unless you plant a seed, you can't expect a tree. Same goes with your CEED preparation. The more you practice suggested tests, sketching and observation skills, the more likely you improve your creative thinking skills; thus helping yourself crack CEED exam. Leave a comment regarding any additions to be included in this topic. Is CEED required and 3D image??? Ya of course, 3D imaging is also required. in this entire web world u r blog is very very good stuffbox for CEED aspirants. awesome....man it was great help i had been looking for correct solution for ceed question from couple of months...you saved so much time....thanks a lot MR.Bhanu chander..
great work collecting them, kudos! would you also please point out anything related to image reflections, lenses, texts under lenses and shadows. Thanks for the comments. Regarding your requirements for image reflections, texts .... The thing is it's bit difficult to search and post at this point of time since the exam is less than 5 days and I too have my own works to be done. For now please adjust with this data, but about lenses I included the details in resources for Part -A post. these are very helpful. thanks a lot. thank u thank u very much......it is really helpfull..! the more i read your blog, the more I realize how much effort you have put in to present it in such a resourceful way. Great job, many thanks. And big God Bless! Any idea for uceed sir???? I am preparing for NID UG. Will this site be sufficient for the written exam of NID? Could you share and let me know the pattern of NID ug ? is that like UCEED ug pattern ? If so, then this blog is the right place to start your preparation. If the exam is similar to NID PG, then this blog helps very little! You need to go for help in some other way. This blog exclusively covers CEED and UCEED topics - almost completely and very little on NID. Sir i am a student of btech mechanical engineering(4th yr) can you suggest me any book for preparation for CEED. Or just preparation by previous year question papers is sufficient. There no prescribed books are for CEED, and unfortunately as far as I heard, books available for CEED are not that wworth. Topics are broadly covered, and so we cannot expect any book to cover all the syllabi. CEED previous papers are there to give you idea, you need to consider similar topics and practice. Heartly thanks to your guidance... :-) I'll be in touch for future queries. Sir, your site is very good. It helps me a lot. Please send the solutions of ceed 2015.
whatever ceed solutions available in this blog is final for this year, as of know you people have to adjust with that coz I have other works too! may be after couple of months, i will consider adding more prev paper sols in this blog. Ya sure, and thanks a lot for your reply. you are doing a great job. because of you only we people are getting motivated the way you are explaining the things over here. i just wanted to know can you please help me which type of mathematical questions can be asked in CEED 2017, which type of books you ll prefer me to prepare. like MAT, CAT preparation book can be ok.
Ihaven;t gone thru CAT or MAT papers, so not sure about that, check if those xams patterns are matching with ceed pattern or not, I don't think u will find many similarities although, it's better to not spend too much time by preparing those for topics which is not required for the exam! I would personally wanna thank you for the efforts you have put in to come up with this website. Really appreciate it. I wanna know what would you advice to prepare for CEED under 15 days. And if possible guide me through how to specifically approach the Sketching part of the paper under such a short period of time i.e. 15 days such that I do not waste time on extra things. P.S. I have prepared for the general study part of the papers. Last year, I made a video to answer this query, probably that should answer your questions, you can chk the below link. Sketching part is involving, u could have taken that initially !! 3. If ur idea generation process is avg and is time taking, then u MUST take as many design examples as possible, and sketch them roughly (or avg., instead of intense sketching) to make u comfortable in idea generation as well as implement them. I think Idea carries more weight and even if u represent them roughly (but clearly - in the sense in a understandable manner) you may score better marks, CEED exam is creative/idea tester and not about sketching testing, sketching is only a part! Hello Bhanu Chander, Thank you for such huge info in crisp manner. I have one question, Do we need to prepare portfolio for phase 2, after cracking CEED phase 1? Thank you so much Sir !!! Dude, do I need to qualify part A first and then only I will be eligible for part B ??? Confusing it is ...coz I saw it somewhere. i hav appeared for CEED 2015. Your blog has really really helped me prepare for it. now the results are out n i am qualified, all thanks to you. one more request to make, can u upload some study materials/references to prepare for Design Aptitude Tests and Interviews. I got a call from IISc plz tell me about DAT. M from GATE not CEED. Mostly, DAT will cover questions from almost all engg fields, esp mechanical, electrical, civil etc. Questions might be below 20 in number I guess. Mostly basics. Kinematics and mechanics is what you need to concentrate more as far as I heard. Second part is making a design, where you will be given design question similar to CEED design part and will be asked to make a design, may be including material selection, usage and so on. unfortunately there's no book as in, for portfolio guide. I will chk if there's any game based portfolio's available online in free in share. U better chk all IIT's/NID's students page to find their portfolio's to get an idea. I was working with an MNC(3 years) before taking a two year break. I believe I can get a good score with CEED and move forward but would the two year gap be an issue during selection ? Your view on this would be great. I have till one month of time. Will it be possible to complete my preparations in a perfect way. yes, provided ur preparation is perfect! Thank you for the beautiful Info. What will be the best time to spend each day for preparation? On which part should I need to spend more time. I am bad at sketching and also aptitude. But I am really passionate for IDC. What do you mean by perfect preparation? what is date expected this time for ceed? Sorry for sending individual messages. and the answers are already available. Check the CEED page of this blog to go through timetable, etc. CEED applications are already out. Perfect prep means putting ur full time and interest. But wait! who said one month time left for CEED ? CEED exam is on Jan. Check the webpage. You have sufficient time. I've included timetable in this blog, that should interest you. You can find that in CEED page, if not let me know. I am looking at the offical page(http://www.gate.iitb.ac.in/ceed2016/), I did not see any updates done in that website for the application, where did you get that date? . I was guessing the date for the exam. Ucr legend man...seriously ur blog hv sufficient material to crack the exam.please help me out wid this..I recently graduated from B.E in mechanical engineering ( 3 yes) before that I had done diploma in mechanical engineering (3 yes) m I eligible ?????? sir .I am mechanical engineer and wanted to be vehicle designer , after lots more search on google somewhere i find about m.des n ceed . so what will be success mantra for me ? n how can i improve my sketching ? please share some books n stuff name please. everything is in this page itself. Go thru it including sketching help, also chk CEED page for knowing about other ceed aspects. There isn't any mantra or talisman, it all depends on ur enthu, hard work, aptitude n finally confidence. I have seen the no. seats in d exam an also the no. of canidates appearing. The no. looked scary. Being of general caste, what is the minimum marks I need to crack it?? Also, what is the minimum marks I need to get into IIT Bombay particularly? P.S.- The materials you provide seem so much better than the other sites. They are of real help. It's hard to tell coz there isn't any standard count on the no. of questions per topic, so practice on list of topics that you feel you're doing better, try to improve them and then move to the harder part. Mostly study design aptitude ques like designers details, culture, image based aptitude etc. I'm metallurgical engineer & after 10th I did Diploma + degree in metallurgical Engineering. As I'm not belong from design, architecture or mechanical field, also I didn't go through 12board.. So I'm eligible for industrial designing coarse & will this things concern in future for me..? I only heard about Hyderabad ACE which people say is the best center for GATE, not sure about coaching institutes in Mumbai. Is it possible to prepare for ceed exam in 6 months??? Means iit's and iisc level preparation..
Can you share the list of topics for Model Aptitude and Numerical questions for CEED/NID DAT. In your blog I found questions and answers which were very helpful but I am looking for list of topics covered under these type of questions. Direct link would be helpful. Also, a quick suggestion- Navigating to different resources becomes difficult as useful resources are scattered throughout the blog which requires us to bookmark every link. If you could have one tab listing all the links or a download section to download all the available PDFs would be very helpful. If you have searched the blog properly in CORRECT place, u would've found what u needed - like how others are able to find. Trying to go through more than 100 posts over night is a good wish but is that practical ? The proper menu tabs above (CEED and NID) r clearly visible n if u click it the link, first post itself will fetch what u were looking - list of topics! Now, u can see what u missed n how u want someone for ur need? Sorry but the suggestion was put forth to be taken as a constructive feedback.Hence it was tagged as a 'suggestion' - idea for consideration and not to be forcefully implemented. It is not about the comfort but we don't want to miss out on any important topic. We sincerely appreciate your effort but the point was suggested so that we make maximum use of the effort you have for this blog. hello sir, can u plz provide some information on movies and books w.r.t CEED exam? Thank you very very much!! Stuff here seems more than enough!! Hi,it said 0.5 for incorrect answer. What if I do not attempt a question. Will there still be negative marking? No,Marks for not attempted question is 0. In your above post “A very good website giving step-by-step guide for beginners from howtodraw” this link not working... kindly have a look & plz do resolve the issue as soon as possible. I think the website has been removed by them. Even the main website home page link is not working. Sadly, you have to adjust with the other links. If I find something, I will include in place of that.